Myths, Legends & Lore: Central New York & The Finger Lakes will transport you into a land of history, legend and mystery located here in the heart of the Empire State. Learn of a time before this land’s existence, and before people lived on the earth. • Witness fugitive slave “Jerry” escape North as thousands of abolitionists in Syracuse gather to set him free with the aid of a battering ram. • Read the strange tale of George “Bill” Bailey, the American mummy, a man not buried until 72 years after his death. • Wonder at the story of the man who believed he was France’s lost Dauphin. • Relive the famed derailment known as the Chocolate Train Wreck. • Read about a Native American woman on the path to sainthood. • Marvel at the discovery of ancient golden tablets from a local drumlin. • Discover the destiny of a painting sold by a church for the price of its frame that later was to be valued at over seven million dollars. • Hear tales old and new about the famed 2000 pound Empeyville Frog, denizen of Central New York. • Relive the legend of the Scythe Tree and the man who never returned from the Civil War. • Laugh over the tale of the whiskey embalmed whale that headed up the Erie Canal, offering tea service in its mammoth mouth. These stories and many more are included in Myths, Legends & Lore: Central New York & The Finger Lakes. This book contains one hundred sixty pages of important and also little known tales from New York State and includes fifty photographs. It’s yours for $19.99. This book is in limited supply. Buy yours now! This book was reviewed in the Fall-Winter, Volume 35:3-4 edition of Voices The Journal of New York Folklore by Constance R. Sullivan-Blum of the ARTS Council of the Southern Finger Lakes. 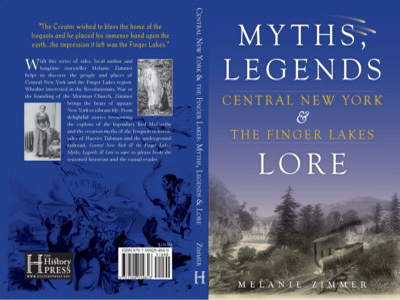 Please contact Melanie Zimmer for book signings or readings for Myths, Legends & Lore: Central New York & The Finger Lakes.